What happens if you’ve had your fill of green beer and busy nightlife for a while, but you still want to celebrate St. Patrick’s Day this week? What better way to celebrate than to settle into a quiet corner of an Irish-inspired dark bar or, even more relaxing, in your favorite chair at home with a glass of Irish whiskey. Of course, not everyone chooses whiskey for the occasion. Is it because they’re confused whether to spell it whiskey or whisky (and is there a difference beyond the spelling)? Drink it neat or mixed in a cocktail. Whatever you prefer! Here are three ways to enjoy the straightforward spirit and three ways to mix Irish whiskey in a cocktail. Pick your glass for drinking Irish whiskey. Start with a vessel that looks good and feels good in your hand. The most common is the rocks glass, also known as a lowball or Old Fashioned glass. For the elite whiskey sipper, a small tulip glass will accentuate the aroma for maximum flavor notes. Neat – As is, in the glass, to get the unmistakable version the whiskey-maker intended. Water – Add a drop or three of water to let the whiskey calm down a bit. The alcoholic content often feels like a burn when drinking neat, so a splash of water mitigates some of the intensity without compromising character. Ice – Add a rock (ice) — a big cube or sphere if you can. Those little ice cubes from the fridge will melt much faster and dilute your Irish whiskey. If you want to sip it cold without losing the powerful body of whiskey, use a rock. If you’re looking for something a little more involved, there are plenty of cocktails that highlight a good Irish whiskey. Consider our top three recommendations. The morning of — or the morning after — St. Patrick’s Day, you’ll probably want some coffee with that trusty companion, Irish whiskey. Fill a 6-ounce glass with hot water and let the glass warm for a minute. Place the sugar cubes in the glass and add the coffee until the glass is 3/4 full. Stir well to dissolve the sugar. Pour 1–1/3 oz. of Irish whiskey in the glass. Over the back of a spoon, layer the whipped heavy cream on top of the coffee and whiskey mixture. Get the strength of whiskey alongside a bittersweet fruit note with a Black Barrel Old Fashioned. Combine ingredients, except orange slice, in a stirring glass. Strain the mixture into a rocks glass over a rock (large ice cube). To elevate your evening, bring a little class to your guests and your moments of relaxing with a velvety, refined Irish Manhattan. Put ice in a rocks glass. Pour whiskey and sweet vermouth into glass and stir. 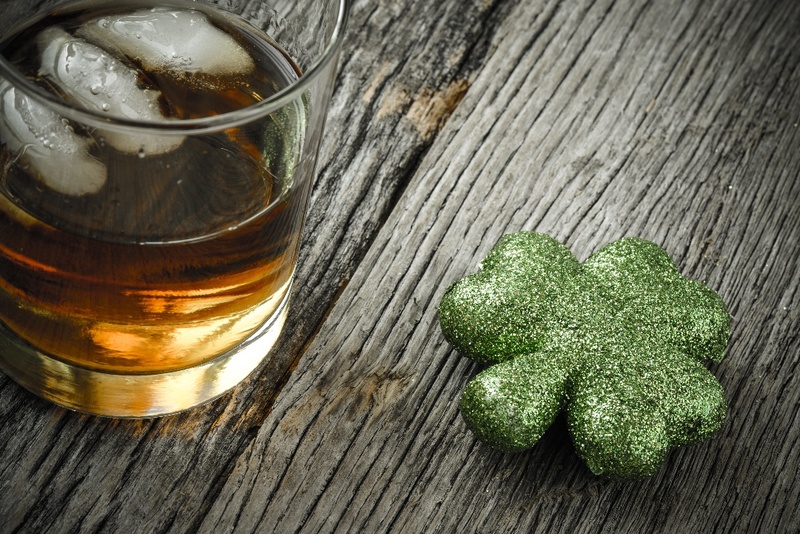 No matter which way you drink Irish whiskey, your St. Patrick’s Day festivities are sure to suit your mood.